Here's a slight upgrade to a tape I shared a few years ago. 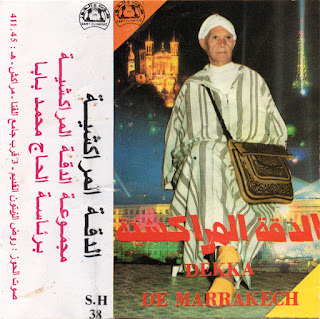 I wanted to share some more of the great Daqqa Marrakchiya music that gets played in the streets of Marrakech on Ashura, and I knew I had another tape. The downside was that the tape turned out to be the same one that I shared previously. 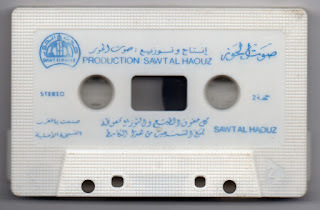 The upside was that there was different, equally great j-card art, and that the tape flip and in/out points were different. I patched the two together, so here is a slight upgrade that adds an additional great 20 seconds of music and that can now be heard as a single track uninterrupted by a tape flip. I like it when Islamic and Jewish holidays line up together. This year both new New Years came in at the same time, as did Ashura and Yom Kippur. Wishing blessings, reflection and inspiration to all. For more info on Daqqa Marrakchiya, see Wikipedia (fr) and Moroccan Tape Stash.